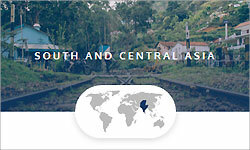 South and Central Asia is a dynamic, rich, and diverse region balancing a respect for traditions with increasing engagement in an interconnected world. This region ranges from the vast steppes and rugged mountains of Central Asia to the deserts and tropics of South Asia. It is attractive for U.S. faculty and professionals because of its historic, religious, cultural and geographic variety. Bountiful opportunities exist across South Asia for teaching and research. Motivated scholars have an opportunity to make a significant impact in this region and are likely to be welcomed as the first or only Fulbright U.S. Scholars stationed at certain universities. Complete information on past Fulbright recipients in South and Central Asia can be found in the Scholar Directory.